Artist Corey Daniels at his gallery. It never ceases to amaze me what incredible people reside in the state of Maine. I am privileged in my job that I come into contact with lots of them. One of the most recent I met is a compulsively creative man by the name of Corey Daniels. It’s hard to describe what he does in a few words so you’ll just have to read the perceptive article in The New York Times about him that appeared this week. Because I was assigned to take photos for the story, I got to peek into his enchanting world, and I came away from it charged up and inspired, awestruck and impressed, filled with a desire to start making something, anything! 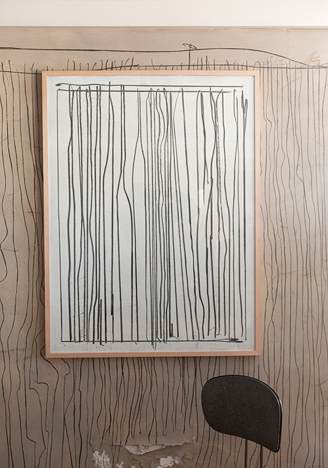 Multiple layers of art cover some spaces in Daniels' house, including here where he has drawn on the wall and then covered it with another piece of his art work. This is someone I’d never heard of before who is quietly going about his business of creating and recreating all day long and into the night. Doing it out of some irrepressible urge. Doing it out of love for shape and form. Making compelling scenes by combining disparate found objects. Painting and drawing on canvases, walls and floors. Taking stunning large format photographs. Regularly reinventing himself and his vision. At a time in his life when most people would be content to curl up on the couch and watch TV in their spare time, Daniels is constantly occupied with crafting things that please his eye. And one of the most wonderful things about it all is he’s doing it without an ego. He’s humble, approachable, full of all the doubts most of the rest of us have. But that doesn’t stop him from getting up everyday and doing his thing, and doing it like no one else. 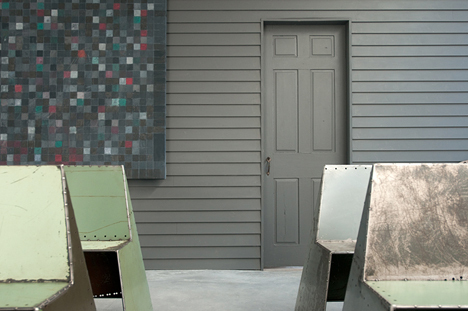 The juxtaposition between the 19th-century house and the contemporary passageway that connects the two older buildings of Daniels' gallery is indicative of his vision—a desire to meld old and new. 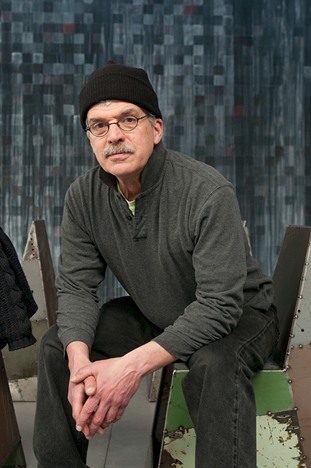 Large-scale paintings by Daniels hang on the walls and chairs by Cleveland metalworker Doug Meyer are aligned in neat rows. Daniels is currently transforming his well-established antique-dealing business housed in two 19th-century buildings connected by a recently renovated modern passageway into more of a contemporary art gallery. But it’s not your every day art gallery. He has a unique and exceptional eye for furniture as art for one thing. And he isn’t necessarily concerned with carrying artists who have already made a name for themselves. He’ll go out on a local art walk, find a piece of sculpture he loves and display it in the gallery. These works of contemporary art, which make their home among the wonderfully worn objects he finds at flea markets and antique shows make for an unusual combination of new and old, a blurring of the line between art and antiques. 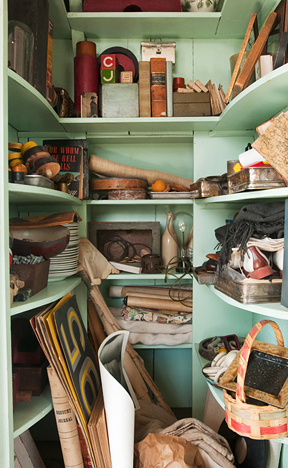 Even Daniels' closets at the gallery are packed with artfully arranged objects that have caught his eye at flea markets and antique shows. If you’re in the state and care about art, you owe yourself a visit to Daniels’ magical kingdom at 2208 Post Road in Wells. And if you’re out of state, I’d venture to say it’s more than worth a special trip. 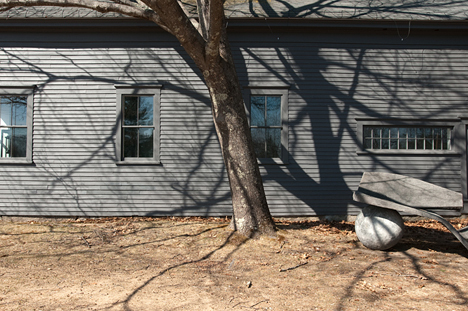 The converted 19th-century barn that makes up part of Daniels' gallery is adorned with a stone sculpture from the 1960s by Tony Conway. This entry was posted in The New York Times and tagged antiques, art, Corey Daniels, gallery, Wells on March 26, 2010 by Stacey Cramp.